Note: This is a user submitted review done by Daneel. Danger Den is a name known throughout the water cooling world for their high quality, high performance CPU water blocks. Over the past few years we�ve seen them churn out more than a few winners for all types of processors. 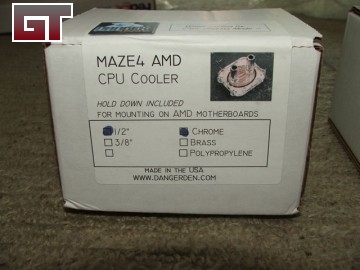 Today, we�ll take a look at the Danger Den Maze 4 CPU water block for AMD Athlon XP/MP chips. The Maze 4 is the latest in Danger Den�s long standing line of Maze water blocks and they have quite a reputation to live up to. Take note of the fact that the block comes pre-lapped to beyond 1200 grit! We had heard about the factory lapping of the Danger Den blocks, but it wasn�t until we investigated that we realized that they lapped it pretty much mirror smooth before shipping. The Maze 4 block is a great improvement over the previous Maze 3 block. Not only does it offer a higher flow rate (lower water resistance) but it also cools better, according to Danger Den. 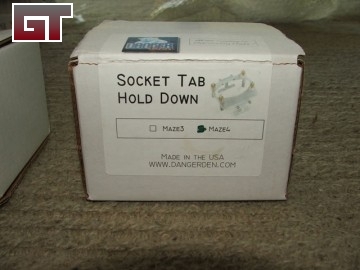 *Note � "1/2" or 3/8" OD Fittings" means that it is compatible with 1/2" or 3/8" ID tubing.